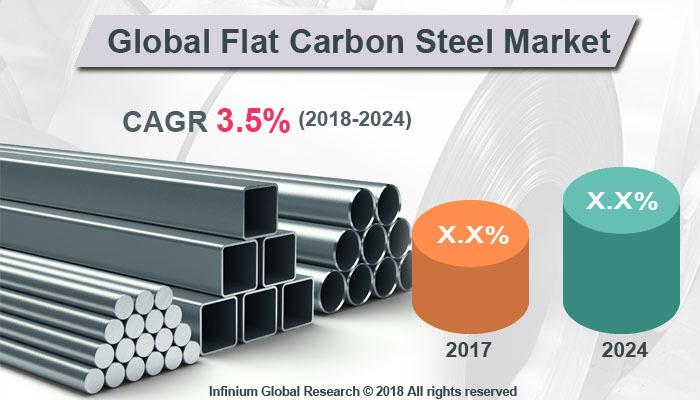 A recent report published by Infinium Global Research on flat carbon steel market provides an in-depth analysis of segments and sub-segments in the global as well as regional flat carbon steel market. The study also highlights the impact of drivers, restraints, and macro indicators on the global and regional flat carbon steel market over the short term as well as long term. The report is a comprehensive presentation of trends, forecast and dollar values of global flat carbon steel market. According to the report, the global flat carbon steel market is projected to grow at a CAGR of 3.5% over the forecast period of 2018-2024. Flat carbon steel is a type of steel that contains a low amount of carbon. Typically flat carbon steel contains 0.04% to 0.30% carbon content. This is one of the largest groups of carbon steel and it covers a great diversity of shapes. It is both malleable and ductile, has a comparatively low tensile strength, and the hardness of the metal’s surface can be improved by carburizing, a heat treatment process. It is easier to cold-form and handle than other grades. The rising demand for steel from the construction and automotive industry acts as a major driver for the growth of the flat carbon steel market. Flat carbon steel is made into flat-rolled sheets and strips, used for shipbuilding, wire, vehicle bodies, and domestic appliances. Flat carbon steel is gaining presence in the automotive industry owing to the growing use of lightweight materials in automotive design. In addition, the expanding infrastructure development in the emerging economies contributes heavily to the growth of flat carbon steel market. The physical properties of flat carbon steel such as excellent strength and toughness make them useful in a large number of applications. As flat carbon steel is resistant to corrosion and abrasion, it is used in enclosures for the car park and airport buildings, the cladding of refurbished tunnels, railway bridge structures and in electric light poles. Furthermore, the rising maintenance and refurbishment activities in the developed nations propel the growth of flat carbon steel market. Moreover, the growing investments in infrastructural development and the rapid industrialization create opportunities for the growth of flat carbon steel market. Geographically, Asia Pacific dominates the flat carbon steel market. The rapid industrialization and the growth of automotive and construction industry are anticipated to drive the growth of flat carbon steel market in the Asia Pacific region. In addition, rising infrastructural development due to rising population and urbanization in India and China fuels the growth of flat carbon steel market. Europe holds the second largest market share in the flat carbon steel owing to the growth of the automotive industry in this region. The report on global flat carbon steel market covers segments such as product and application. On the basis of product, the sub-markets include plates, hot-rolled coils, cold-rolled coils, galvanized coils, and pre-painted steel coils. On the basis of application, the sub-markets include building & infrastructure, transportation, energy, mechanical equipment manufacturing, and others. The report provides profiles of the companies in the market such as ArcelorMittal S.A., China BaoWu Group Corporation Ltd., Nippon Steel & Sumitomo Metal Corporation, POSCO Steel, Dongkuk Steel, HYUNDAI STEEL, Dongbu Steel, EVRAZ plc, SAIL, and JFE Steel Corporation. The report provides deep insights into the demand forecasts, market trends, and micro and macro indicators. In addition, this report provides insights into the factors that are driving and restraining the growth in this market. Moreover, The IGR-Growth Matrix analysis given in the report brings an insight into the investment areas that existing or new market players can consider. The report provides insights into the market using analytical tools such as Porter's five forces analysis and DRO analysis of flat carbon steel market. Moreover, the study highlights current market trends and provides forecast from 2018-2024. We also have highlighted future trends in the market that will affect the demand during the forecast period. Moreover, the competitive analysis given in each regional market brings an insight into the market share of the leading players.